The fog was so thick at the top of the Skyline lift that the tails of my skis couldn’t see the tips. Seventh-grade me hadn’t made the jump to contact lenses yet, and my hand-me-down goggles hadn’t been state-of-the-art since 1973. This meant that I had two layers of fogged glass and plastic between me and the already hazy world. It was my first trip up on the Ski Bus, a wonderful program through the Parks Department involving a few hundred buses, enough kids to populate several smaller nations, and some criminally underpaid bus-drivers. They (the kids, not the bus-drivers) are chauffeured to various local slopes to experience hurtling down them on skis and boards. 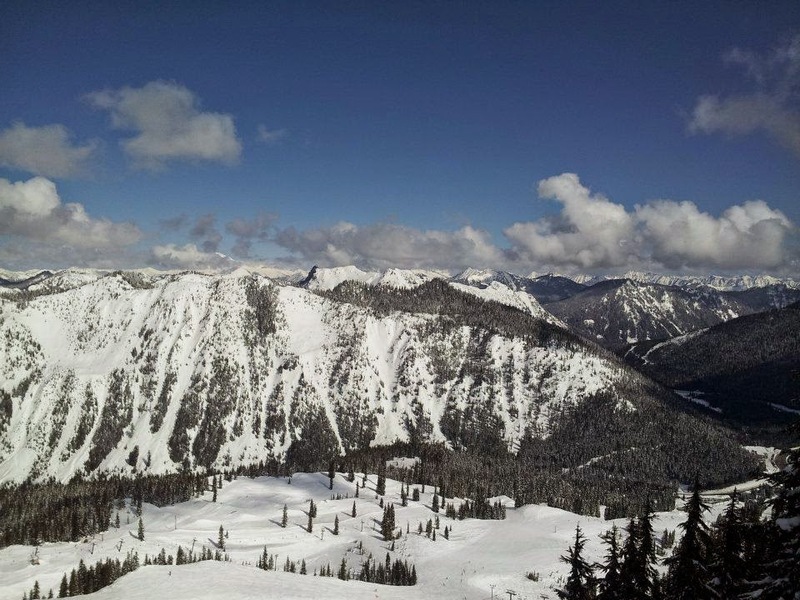 This occurs every Saturday for the several months in which Washington State has “good” snow. It is the difference for most children between skiing three days a year and getting in a few dozen. This in turn is the difference, for many of these young folk, between a life where skiing or boarding is something “you did a little as a kid,” and having it become a life-long passion. I had been skiing every year since I was four, but these trips consisted of a day or two each year, in other words never enough to get me past the level of rank beginner. They involved a lot of screaming and crying my way down bunny slopes, often off the Daisy Chair right there at Steven’s Pass. My friends were all superior skiers, and so when they decided to attempt a run far beyond my level, especially in these conditions, I told them I’d wait below and meet up with them afterwards. Haha! I am kidding, of course. I tagged along, and it wasn’t until the world below faded away into gray nothingness that I began to realize I had made a terrible mistake. Most of the runs down Skyline are blues. They are steep, but not too steep. They are groomed, fairly even. In good conditions, a decent skier can make long, S-shaped turns the whole way down, and arrive at the bottom going very quickly- but still in control. These were not good conditions. And I was not a decent skier. We took a sharp right off the top of the lift, heading down the narrow Barrier Ridge. 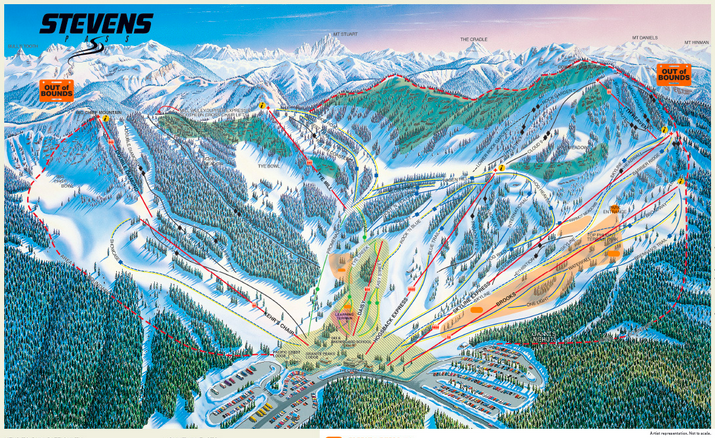 Although it can be difficult to see on the trail map, the adjacent run - Headwall - runs straight down into a large bowl. As it was a marvelous year for snow, the edges had been built up, so that there was a five foot drop into the bowl, all along that left edge. This should have terrified me, but since I hadn’t been able to see that far down off the lift, I had no idea what was waiting for me. I made my first turn, cutting left, blind, feeling my way along. I cut right. Back left. Okay, I was getting the hang of it. Uh-oh, my turn right wasn’t enough, I was heading down to quickly. I turned hard left again, trying to compensate, and suddenly there were trees looming above me. Starting to panic now, I turned back right, cutting as hard a I could across the slope, hoping no-one was coming. I tried to dig my skis into the snow, but something was wrong. They wouldn’t dig. “It’s because there is no snow. I’m flying! Wait…” I think I tried to scream, but only managed to sort of croak through my neck-warmer. Below me was the same vague grayness I’d been skiing through all day. And then, suddenly, there was snow again! Only I still couldn’t quite get my skis to dig in because they were no longer attached to me, or even nearby. I’d lost my grip on my poles, but thank god I still had the wrist-straps on- otherwise it would have been much harder for them to stab me as I bounced my way down the slope. When I finally came to rest, face-down in the snowbank, I immediately swore a very solemn oath to myself about never, ever skiing again. Thankfully, I was able to get over the embarrassment, and finish out the day. A good thing too, or I would never have had the opportunity to use my ski-class as human bowling pins (teacher included)! Or I might never have lost my bottom ski as it became embedded in the top few inches of a tree, poking up out of the snow. Which of course would happen as I was traversing my first ever double black diamond. Good thing that giant hole stopped my headlong slide or else... Well, those are stories for a different day.